Building new infrastructure on one of the most intensively developed plots of land on the planet can be near impossible without large-scale demolition and disruption. Though tough on budgets and quality of life, these upgrades are vital, especially at a time when the foundations of New York City’s life and economy — subways, aqueducts, and a certain rail tunnel to New Jersey — are nearing (or already beyond) obsolescence. Our waste management system is also notably flawed, its inefficiencies unnecessarily driving up costs and increasing the greenhouse gas emissions that have already begun to threaten homes, businesses, and that same vulnerable infrastructure. The elegance of Juliette Spertus and Benjamin Miller‘s proposal for the integration of pneumatic tubes into existing infrastructure — in this case, the High Line — comes in part from how minimally invasive its implementation would be. The proposed system, which would mark a third foray into pneumatic waste systems in the city after Roosevelt Island’s and Hudson Yard’s, also proves its worth by facilitating myriad goals articulated in the de Blasio administration’s OneNYC plan. Here, the two designers, researchers, and waste management experts articulate how a network that serves buildings across multiple developments could expand the utility of infrastructural repurposing and demonstrate the feasibility and attendant achievements of rethinking our waste management practices. This isn’t just fast trash; it’s a pioneering approach that could reshape how much waste we create and how it’s collected.–J.T. Collecting garbage via pneumatic tubes was almost unheard of in New York when the Fast Trash exhibit celebrated Roosevelt Island’s underground vacuum collection system in 2010. By then that system, which uses negative air pressure to pull solid waste from connected disposal points through a network of pipes to a central collection terminal, had been transporting the Island’s trash beneath Main Street (and below the radar of most urban planners) since 1975. Now, five years later, this alternative to garbage trucks is attracting serious attention. The Related Companies, the city’s largest developer, plans to “tube up” the residential towers in Hudson Yards, its massive real estate development atop the MTA’s west side rail yard. The first large-scale pneumatic waste network to be constructed in the US since Roosevelt Island’s, it will serve 5,000 apartments in six buildings, the first of which is scheduled for completion in 2018. While the US has been relatively slow to adopt pneumatic waste technology, hundreds of systems have been installed in Europe, Asia, and the Middle East. In the last five years, market competition has also led to important technological advances that lower the hurdles for installing pneumatic waste systems. These networks can now use significantly narrower, more flexible, cheaper, and more easily installed plastic pipes that require less air and energy to move waste than did their steel-tube ancestors. Both the Hudson Yards and Roosevelt Island tube networks, like most pneumatic facilities, are designed to support an individual master plan. 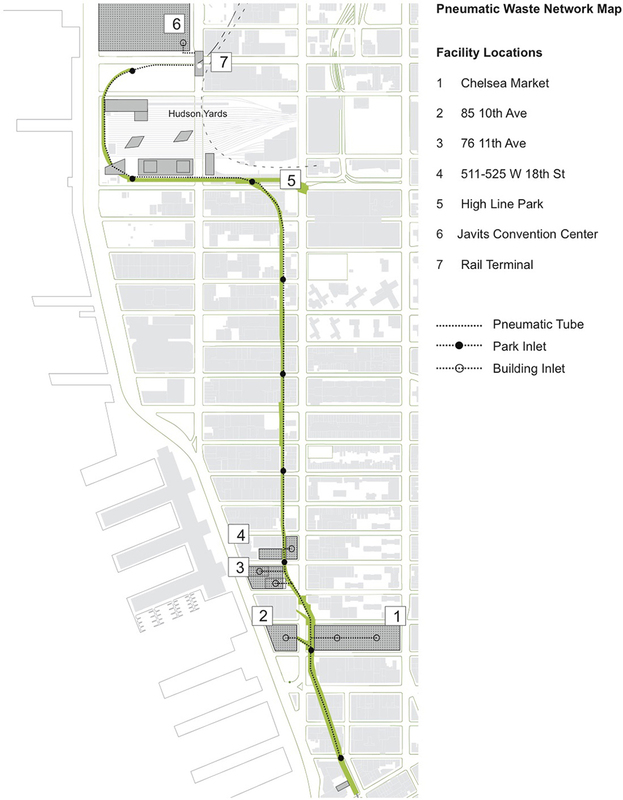 On Roosevelt Island, the system was meant to limit truck traffic within a pedestrian-oriented neighborhood; in Hudson Yards, pneumatic tubes will reduce the considerable staff time devoted to moving trash from storage to the curb. These are important, neighborhood-specific benefits with implications for municipal budgets, public health, environmental sustainability, and quality of life. But the positive impacts of automatic waste collection could be magnified — and extended well beyond a single locality — by better integrating the network’s design with the city’s overall waste management system and allowing the tubes to accept waste from any building, not just those owned or controlled by a single entity. 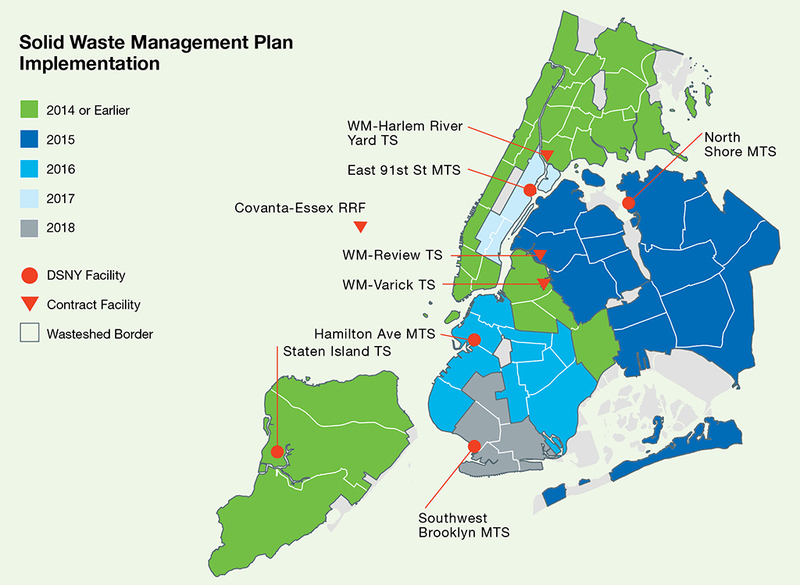 The de Blasio administration’s OneNYC Plan sets forth a series of goals and initiatives to address problems related to the city’s current solid waste management practices. These include reducing the impacts of trucks; decreasing greenhouse gas emissions and energy use; expanding the use of renewable energy and decentralized power production; advancing environmental justice; promoting “triple bottom-line” infrastructural investments with economic, environmental, and social benefits; and improving air quality. Tube-based systems, if designed to address issues beyond the needs of a single development, could help achieve all these objectives. If pneumatic systems are desirable, how is it possible to add tubes to a city that has seen over 200 years of intensive development above and below ground? Typically, tunneling or trenching is required to thread tubes beneath already built streets. But other kinds of linear transport infrastructure may offer less costly options for installation: tubes could be hung in subway vaults, for example, or affixed to viaducts to offer connections between multiple parcels of land and a central collection terminal. And though tube installations built in existing neighborhoods have relied mainly on streetscape collection points, inlets connected to pipes suspended from existing infrastructure could be installed in the interiors of new and existing buildings. We studied the feasibility of retrofitting neighborhoods with pneumatic tubes by piggy-backing on existing infrastructure in a 2013 report for two New York State agencies. In the New York City neighborhoods we studied, we found it to be physically and operationally feasible to achieve substantial reductions in truck miles, greenhouse gas emissions, and long-term costs. The challenges of connecting buildings along the High Line to the tube will vary depending on the building. South of the terminal, the High Line rises about 20 feet above the street. Although pneumatic tubes can gradually slope up or down, connecting the High Line-level pipe to a basement waste room in adjacent buildings would be impractical. Instead, inlets located in small, utility-closet-size waste rooms would connect to the tube at the second-floor level. Wastes from networked buildings would be brought to the second floor rather than the basement; in buildings that have them, gravity-fed waste chutes would be retrofitted with a valve to connect directly to the tube. Planned buildings for which final designs are not yet complete would offer the easiest hook-ups. Former industrial buildings once served by the High Line viaduct, such as the block-long Chelsea Market or the complex at 85 10th Avenue, should be relatively easy to connect, and connecting other adjacent buildings may also be practicable. At each disposal point along the corridor, three inlets would accept recyclables (metal, glass, plastic, paper), organics, and refuse. A single twelve-inch pneumatic tube would pull the various waste fractions at different times so that they are automatically compacted into separate containers at the terminal. The containers would then be hauled by rail from the pneumatic terminal to centralized transfer, processing, or disposal locations where New York City waste is already (or will soon be) handled. From the north end of the High Line, materials will travel along the rail line that once hauled freight to and from the elevated-turned-park and is now used exclusively for passenger traffic. When it reaches the Bronx, this line forks. Refuse will continue north to a bridge over the Hudson just south of Albany. Recyclables and organics will head east to lines that reach Queens, Brooklyn, and Long Island across Gustav Lindenthal’s magnificent Hell Gate Bridge. A separate network of two-inch pipes — using a different type of pneumatic technology designed specifically for kitchen waste — would transport restaurant scraps to a micro-anaerobic digestion facility housed in a set of shipping containers beneath the park. Anaerobic digestion uses bacteria to break organic material down into biogas and liquid and solid residues that can be cured for use as soil amendment. The biogas can be used to replace natural gas for cooking, cooling, and heating; compressed into vehicle fuel; or burned to generate electricity. This process has been used on farms and in waste-water treatment plants for decades. The Newtown Creek Wastewater Treatment Plant in Greenpoint is beginning to accept food waste for “digestion” in this manner, and dedicated food-waste facilities are now being built around the country to recover energy and produce compost. Small-scale, prefabricated digesters just coming onto the market are well adapted to the energy-rich food waste generated in commercial kitchens and present a viable option for the High Line restaurant-waste network. While the 26 tons per day the High Line Corridor system would collect is only a drop in New York City’s 25,000-ton daily waste management bucket, it would demonstrate an incremental way to take on many of the fundamental challenges identified in the OneNYC Plan. And as shown in our recently completed cost-benefit analysis of the High Line Corridor concept for the MetroFreight Volvo Center of Excellence, it would produce significant benefits on its own. New York’s current waste management system sends rumbling trucks to every building in the city multiple times a week to pick up bags at the curb or bins on loading docks. Separate trucks collect refuse, recyclables, and organics. Municipal trucks pick up residential materials while trucks from any number of different carting companies pick up waste from businesses in any building. These heavy, noisy, low-mileage-efficiency trucks then course through city streets to centralized transfer facilities. Costly to build and operate, these facilities are also subject to intense local opposition (as recent experience with the marine facility at East 91st Street in Manhattan demonstrates) because they concentrate truck traffic at just a handful of locations. Four of the municipal refuse transfer facilities load containerized waste directly onto railcars for transport to landfills an average of 600 miles away. The other four, once operational, will load the containers onto barges that will then be towed across the harbor for unloading and reloading onto railcars. Some of this refuse is sent to facilities where electricity is produced from its combustion. (Refuse from Manhattan’s West Side, including the High Line Corridor, is trucked directly to such a facility in Newark; East Side and northern Queens’ refuse will be railed — after a preliminary barge-cruise across New York Harbor — to Niagara Falls.) But the majority is sent to landfills, another major source of greenhouse gas emissions, to permanently despoil 140 acres of land a year. Residential recyclables are trucked or barged to a state-of-the-art recycling facility on the Brooklyn waterfront. Someday residential organics may be taken to pre-processing and anaerobic-digestion facilities like those being developed in Brooklyn or to a compost facility like the one used for Staten Island’s material. However, until a significant amount of new pre-processing and digestion capacity is developed, most will continue to be trucked to small compost facilities in upstate New York and Connecticut that lack the capacity to serve the city’s needs. OneNYC seeks to improve this situation in a variety of ways. It sets a goal of reducing by 90% the amount of waste collected for disposal by 2030 through decreasing the amount of refuse generated and increasing the amount of material recycled or turned into biogas and compost. It calls for a blueprint for a “Save-As-You-Throw” system that (like water-metering) charges waste generators on a volume basis as a way to incentivize waste reduction, something that poses challenges in multi-unit buildings. It includes initiatives for expanding recycling and developing organics-processing capacity. It entertains the possibility of a dramatic change from the current commercial waste regime by studying the potential advantages of having a single commercial carter collect waste from one area. And it seeks to increase environmental equity by reducing the numbers of trucks in any one neighborhood, to shift the movement of materials from trucks to trains, and to achieve an 80% reduction in greenhouse gases by 2050. Pneumatic tube systems — such as the one we propose for the High Line Corridor — would not only reduce private-sector waste storage and handling costs but also contribute to all of these public-benefit objectives. The corridor network would facilitate recycling by eliminating the need for storing waste materials and for handling them twice — moving them from their origination point to storage and then from storage to the curb or loading dock. It would provide a practicable way to collect putrescible food waste from apartment buildings, since collection would occur multiple times a day rather than weekly. And since pneumatic inlets with card readers would allow each waste generator to be billed for what she throws away (recycling and compost would be free), it would incentivize waste reduction. The ability to keep track of inputs also allows commercial and residential waste to be collected together. As a result, more material would be recycled or processed for biogas and compost, and less material would require long-distance transport to disposal facilities, with attendant reductions in greenhouse gas emissions and energy use. On the street, the High Line Corridor would eliminate over 18,000 truck miles a year from even the best-possible truck-based system. (In order to compare the potential benefits of a pneumatic system to the lowest impacts achievable by a truck-based system, we assumed that the city already had a single entity collecting all residential and commercial wastes from the High Line Corridor.) It would save over 5,000 gallons of diesel fuel compared to this single-hauler truck system, thus reducing emissions of diesel particulates and other pollutants. And although the system’s $10 million capital cost would be greater than the neighborhood’s share of the purchase cost of trucks and garages used for conventional collection, its lower operating costs would cut net annual costs by 40%. Direct transfer of air-tight containers of refuse, recyclables, and organics from the pneumatic terminal onto railcars would further eliminate the need to transport the material from the neighborhood by truck. Accordingly, fewer trucks would be sent into neighborhoods burdened by centralized transfer stations, and the city’s reliance on costly transfer operations reduced. The volumes of refuse requiring long-distance transport and disposal would be shrunk as well, with attendant savings in emissions, energy use, and costs. The system would also generate energy: the biogas produced from the on-site restaurant-waste digester could provide renewable, distributed energy for local use. A pneumatic system’s energy efficiency, compared to that of conventional collection, depends on site-specific factors, including the location of garages and “first-dump” sites (transfer stations, processing, or disposal facilities) relative to collection routes, as well as the density of these routes. In a previous study, we showed that energy efficiency could be reduced by over 50% relative to actual existing collection in the High Line Corridor, where collection responsibilities are divided between the City’s Sanitation Department, Parks Department, and multiple private carters. But compared to the best-case assumption that only one entity collects materials by truck and takes them to the same locations, energy use in the pneumatic case is roughly doubled. 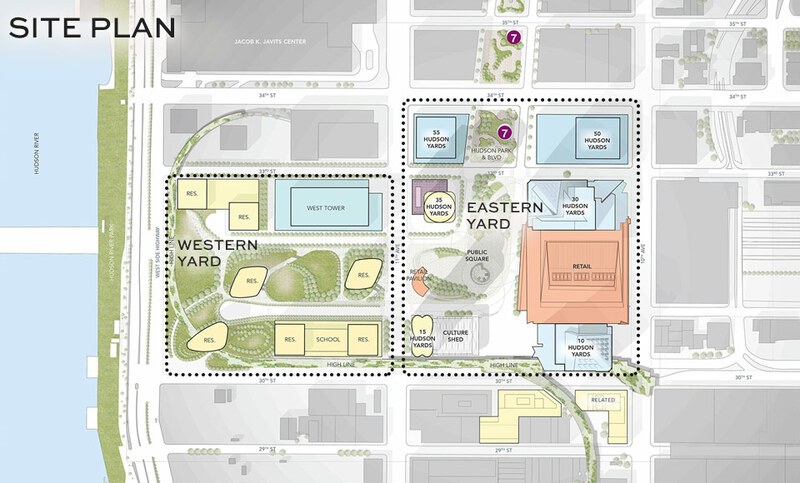 This best case assumption also benefits from unusually favorable circumstances of the High Line Corridor with regard to truck collection: the transfer station for recyclables, for example, is adjacent to the southern end of the High Line. In a more typical situation, one would expect to find a decrease. Importantly, however, the pneumatic system is powered by electricity, which can be produced by sustainable, low-carbon sources, rather than liquid, carbon-based, transportation fuel. Demonstrating the achievement of these benefits through the High Line Corridor Pneumatic Waste Initiative could encourage the use of some underlying concepts — such as Save-as-You-Throw and franchised collection zones — even in neighborhoods without tubes. And just as the High Line Park inspired others around the country to seek recreational uses for legacy transportation infrastructure, a tube network under it could expand the concept of infrastructural repurposing to include hosting neighborhood-scale waste networks that reduce congestion and generate energy from food waste. As the Hudson Yards development shows, pneumatic collection is a mature technology. We don’t expect the City to fully incorporate pneumatic networks into its solid waste management planning just yet (although we’d be delighted if it would). We don’t expect developers to invest in the implementation of progressive new policies and infrastructures or maximize reductions in truck miles on their own dime. But we are beginning to translate the High Line Corridor from a research project into a plan for engaging a wide range of potential stake-holders — right-of-way owners, building managers and developers, businesses, residents, City and State agencies, private carters, investors — in order to implement a full-scale pilot. If we can demonstrate ways to clear some of the hurdles that prevent leveraging this innovative technology for broader benefit, a successful High Line Corridor could send New York City closer to realizing One NYC’s vision for 2030. Benjamin Miller, a co-founder of ClosedLoops, is also the senior research associate for Freight Programs at the University Transportation Research Center, Region II. A former director of policy planning for the New York City Department of Sanitation (where he was project manager and principal author of the City’s first Solid Waste Management Plan), he is the author of Fat of the Land: Garbage in New York, the Last 200 Years and numerous reports and articles on environmental policy issues. I am a new process engineer for a PPG manufacturing plant in Gainesville, TX and am researching information on pneumatic trash collection systems to possibly implement into our facility to move paper and plastic waste (spent bags of material) from multiple points on the shop floor, through ductwork on the ceiling, out to a trash compactor. I learned about ClosedLoops through this research and I was wondering if you could point me in the right direction for information. While this project is nowhere near the scale of city infrastructure, it IS attempting to accomplish the same goals of reduced waste and emissions. I am finding it difficult to learn of US based pneumatic engineering groups or other organizations to A) learn more about the feasibility of a project on this scale and scope and B) have a proximity to our plant for a site visit consultation. Any information or assistance would be appreciated.